In the past few months, more and more people started to talk about the one single platform that outperformed in organic reach and results at every other major Social Media. You might have heard a friend of yours bragging about all brand new the leads he’s generating every day using automation, or you’ve seen competitors getting thousands of views on a single post, and you’re wondering how they’re doing it. For me too, no other platform besides my Facebook Group brought so many results considering the time invested. Growing on LinkedIn indeed, it’s the one single platform I used to jumpstart my brand new consulting company and get the first clients rapidly. But it also got me incredible surprises, such as podcasts features, speaking gigs, and most importantly, new friendships. 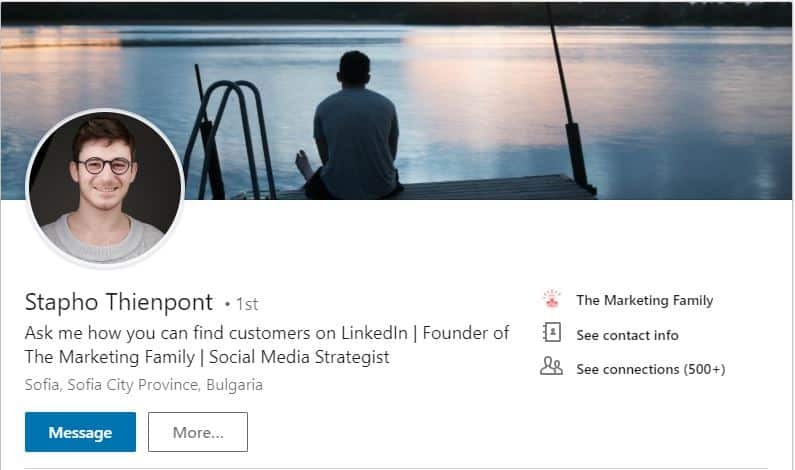 In this post, I will explain to you the inside secrets that 6-figure LinkedIn agencies use to generate leads, both inbound and outbound. If you run a B2B service (or if you think your target market is, in general, on LinkedIn), this post is a must read for you. Some people like to start posts with BS such as statistics about LinkedIn and how much it grew in the past years, how much Microsoft is investing in it. I don’t like this kind of stuff. I think it’s boring, and I assume that if you’re reading this post you already grasped the potential of this platform, so let’s jump into what’s working right now. In this post, I will describe my strategy, which is a combination of both inbound and outbound and that I’ve crafted by talking to people who are generating 6-figures using LinkedIn only. However, you don’t have to do both inbound and outbound, read on and decide what’s best for your business. 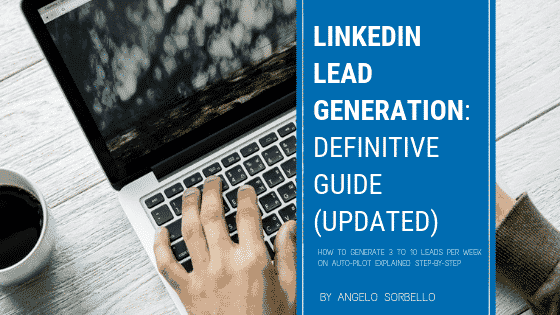 Four main steps compose a proper and complete LinkedIn Lead Generation strategy. Simple as that. In this post, I’m going to explain you every single step of the process. Alright, I promise, we’ll jump right in the pure-gold-tactics right after this. But I need to insert quick warming for a matter of honesty (and because my lawyer prefers I do so), but I promise I’ll be quick. Now you know about it. 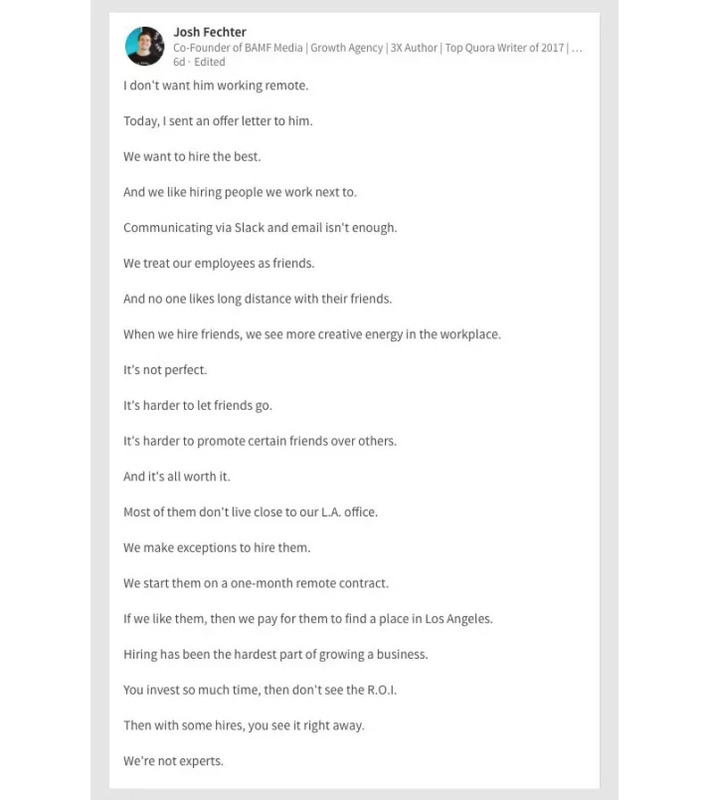 LinkedIn can be powerful. But let’s be concise: don’t overdo it. I want to clarify that I never suggest you break the Terms and Conditions of LinkedIn. If you’re already getting great results, calm down and consider first if you can handle more leads. It often amazes me how some of my consulting clients are confused about who is their target market. With this approach, you will hardly succeed. Your first step to is to get specific with what is your goal and who you’re trying to target. Simplify. Among all the positions and industries, who is the ultimate decision maker who is more likely to buy from you. Second, what is your goal? Do you want them to sign-up to your email list, get them on the phone, or whatever else? Once you decided this goal and target, optimize everything based on that, starting with your profile. Simple as that, to target on LinkedIn the most relevant information you’re going to use are: Job Title, Location, and if you have Sales Navigator, Company Size, and if applicable, Industry. Other information can be beneficial, such as targeting based on technologies used by the company (e.g., Shopify, Magento, etc.) but more advanced and harder to scale. Ultimately it’s your choice to test and see what is working best for you. Here’s an example of a target I recently used for a client who was looking to target prospects in the automotive industry. Sales Navigator is a tool included in the Premium subscription “Sales” of LinkedIn. It allows you to get a more specific target and some other benefits such as increased limits of daily actions. In general, my advice is to use it if you can afford it and if LinkedIn is a primary source of revenue for your business. If not, don’t you worry, you can use the strategies of this guide even without having it. One of the benefits of using the Sales Navigator it’s that with it you can craft very easily a more personalized message which, of course, will give you better results. How? It allows you to quickly check if a profile in your target market recently updated joined a new company (“Congrats dude! … Now Buy! ), was featured on the news, or changed his profile less than 90 days ago. Alright, now you know who you’re trying to target, in which industry, which position he has, and most importantly, what is your goal when interacting with him. It’s now time to optimize your profile to get results. With the techniques I’m showing you in this article, you will get a surge of views and leads. It’s cool. But if at the end of they day they don’t bring sales, guess what, you’re just wasting your time. Your profile isn’t the number 1 thing that will help you to generate leads, but if it looks good and it’s well optimized, it will help you to ask for higher pricing, and you will make your life easier when it comes to closing the sale. Let’s begin. First of all, go on your profile and optimize your title. It’s easy. You merely want to say what do you do and who for. Then add a benefit that your target market cares about. Try to be as specific as possible and result oriented. Check out what my friend Stapho wrote in the picture below. Essential and straightforward, but effective. Once you’re done with the headline, it’s time for you to optimize your summary. Depending on how pushy/aggressive you’d like to be, you can make it more of sales page or more general. No matter what you decide, make it about THEM. Sounds counterintuitive, but think about it. That’s what your client is thinking about. Write about the results you got. Maybe you sold your company in the past, and you know your target market is the founder of a funded startup which is trying to push for an exit in a couple of years. No matter how much of a skilled copywriter or storyteller you are (if you don’t have time to master these skills, give me a call) Think only about one thing: Make them care. It’s time to bring your storytelling and copywriting skills up. Below you can read a part of my Summary. For more, check my profile here and don’t forget to write me a “Recommendation” if you’ve found any of my articles useful. Once you updated your summary, go over your “Experience” section, and make sure, if possible, that you have an icon/logo for each company you’ve worked for. Add a professional picture where you’re smiling (huge competence trigger) and don’t waste your “Cover photo” by adding a damn lion as many do. Yeah, a Lion, if not a picture of the Universe, or a lovely landscape. Your “cover photo” it’s an opportunity as well to show expertise, so, if you have a picture of yourself speaking in public, guess what, that’s where you can use it. After you’re done with that, try to get as much credibility as possible. Ask co-workers, past clients, and friends for endorsements and recommendations. The easiest way to get them, is, of course, to give them first. People will be glad to give back. Part of a complete LinkedIn strategy consists of increasing your number of connections every day. Because of this, what’s written in your connection message it’s crucial. Your goal is to have the highest acceptance rate possible. Why? Because every new connection isn’t only an opportunity to contact a potential client once, but also to show him your future content for… Well, life. When you write your connection message, you want to make it as specific and personalized as possible to the person you’re sending it. Use location, job title, industry, and whether another factor might be relevant. Connection messages will sometime get you a response, but without following up, it’s like asking to a person you like his/her phone number and never writing him once he/she gave it to you. When following up, be specific (use location, job position, news feature, latest blog post, etc.). Show them their benefit and ask for a call. Be genuine and humorous if possible. Don’t stress too much about it, by testing if it will improve over time. Focus on making them care. Continuously ask yourself these two questions: “Why should they care?” and “Is my message written as a robot would?”. Also, never forget to read out loud your messages. If you feel like certain parts are flowing well when you’re reading them, change them. The perfect spot where you want to be in is to have a unique angle or offer something free. If you don’t have anything yet, be specific and result oriented, it will be enough. I’m Sal, a Social Skills coach and I specialize in helping men to get at least three dates per week. I’m sure you’re already killing it, and you’re doing your best to get dates with hot girls – I do still have a few techniques that can get you an extra three dates per week, though. Need any help to get results? I can offer you a free call this week to discuss ideas. Based on the tests that Astrogrowth performed, LinkedIn has a daily limit of about 25 actions per day for an already warmed up accounts. Keep in mind that limits are always changing and multiple factors affect limits. Start on 25 a day, and if you want to push to 50 a day after 7 to 14 days. Try not to go over 50 if you don’t want to risk losing your account. This limit ’s about “actions,” which includes visiting people profiles, sending them connection requests, and messaging them all in one. So don’t go too fast, and be patient. But how do you send 25 messages per day? There are three options. It’s undoubtedly the most high-touch and generally most effective regarding response rate. However, it’s widely time-consuming. 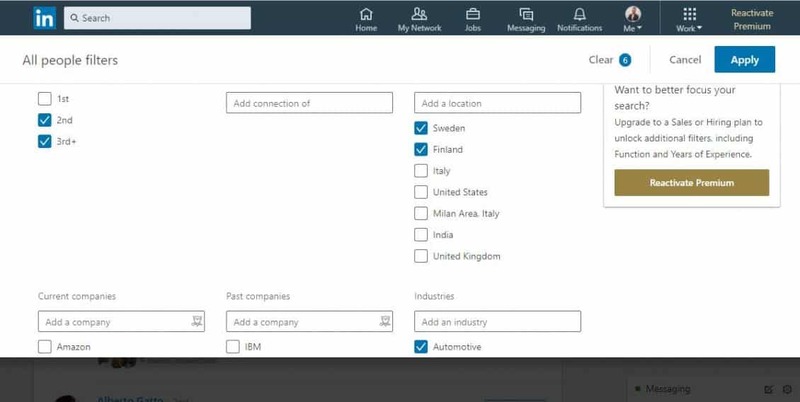 If you decide to send the connections to request yourself, of course, try to personalize them as much as possible. Instead of doing it manually yourself, hire a VA (this service is my go-to) to do it for you. The good thing of having a VA is that it can help you have a better advanced and personalized targeting strategies you can use, such as letting your VA send an email after he sent your prospect a connection request on LinkedIn. Another example would be researching for the latest blog post published by your prospect and send them a personalized message which includes something related to what’s written in the article. Basically, a VA allows you to do stuff that software cannot, without letting you waste an entire day searching info about a single prospect. Automation used to work amazingly up to one year ago. Now the risk to get your account suspended it’s high, especially if you don’t have a Premium account. In short: I don’t use and don’t suggest you use automation software. If you have LinkedIn Sales Navigator, your limits will be a bit higher than normal, but this doesn’t exempt your account from getting banned. You have seen them already. Posts like the one in the picture Getting thousands of likes and comments. The truth is yep, they work, they got me beautiful relationships with thought leaders in the industry and podcasts invitation, and so on. And yes, even qualified leads. But it’s not all glitters and gold. Social media values consistency, so if you decide to post your content on LinkedIn, you will have to do it every day. An exciting way to get the ball rolling is to join or create one of the so-called LinkedIn Engagement Pods. It’s a bunch of common friends who like and comment on the posts of each other so that the algorithm will most likely value your posts as interesting and it will consequently show them to more people. Increase your number of connections every day. Write consistently if you want. If you want, write consistently and use engagement pods to get the first ten likes and comments to make your post get seen by 2+ connections.